Quiet Lunch Magazine ‡ October 1st, 2012. – October 7th, 2012. | | Quiet Lunch. 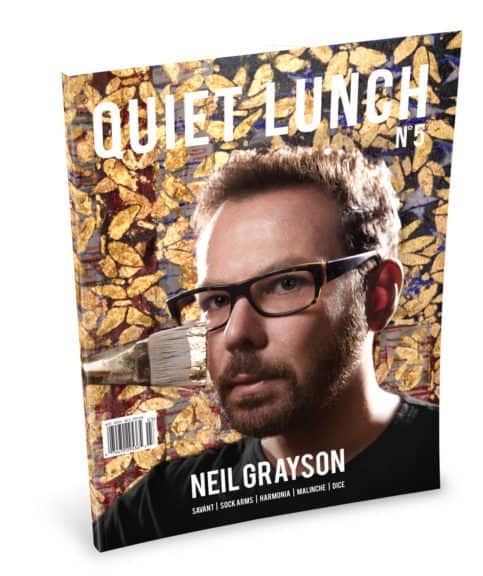 Quiet Lunch Magazine ‡ October 1st, 2012. – October 7th, 2012. After two months without a theme, we are pleased to announce that the month of October will be known as Isms Month. For the next 31 days, Quiet Lunch will be exploring the world of isms — particularly Materialism, Sexism, Racism, and Classism. Through art and other mediums, we plan to examine the nature of each ism and how they affect our modern society. Can we really escape materialism? What does it really take to do away with sexism? Is racism a way of life? Is classism more dominant than we thought? In all, each will week highlight a different ism and each week will feature a round table discussion that dissects that very ism. In the end, we hope bring new ideas to the forefront and, with a little effort, move closer to a solution that can benefit us all. This week’s featured ism is Materialism. We also take the opportunity to interview curator and artist, Derrick B. Harden! 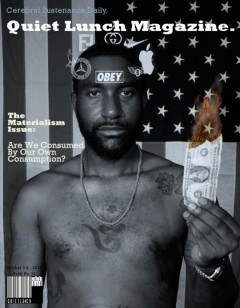 Harden was nice enough to grace our cover, entertain our cameras and explain to us his theory of positive materialism. Photography by Gail Thacker/Quiet Lunch Magazine. As human beings, we all want nice things in life, there is no escape from that. I guess the main problem is when materialism and the continues lies is used to enslave the people and not educate, particular in the U.S.A.